Kinna was leaving to the States to finally be with Neerav. So we decided to meet up with the handful of Manipal classmates in Bangalore. Its a different story that in the end it was only us, Kinna and Swaroop. We have been to the Egg Factory before and thoroughly enjoyed it. The others had heard of it and always wanted to try it... so it made the perfect place to catch up. In true tribute to our Manipal days, we just decided to order dishes, place it in the centre and attack... 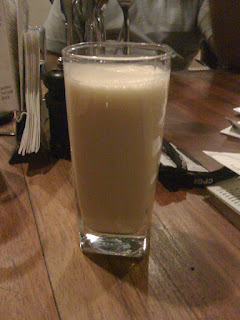 This time round while Swaroop and Kinna opted for the Pink Lady, Sudhakar and I went in for the Morning Burst which was bananas,, orange juice, yoghurt and milk. Yummy!!! 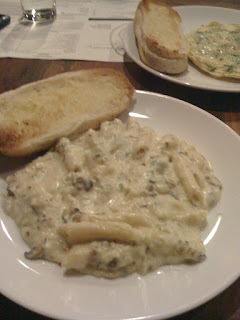 Next came the Eggs and Mushroom Ragout Penne, which as a review I recently read mentioned was absolutely scrumptious. 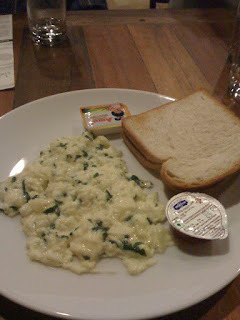 The eggs were creamy and the cheese sauce was just right. 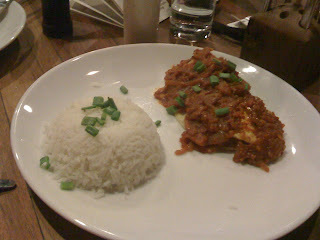 For Anoushka we decided to go for rice option and therefore took the steam rice with egg sambal, which came with an omelette dunked in a very desi tomato based sauce, finished off with spring onions. This time round we did not opt for desserts. Get easier updates through Facebook! 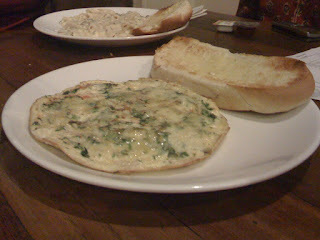 Searching for a good restaurant in Bangalore? Let me help you. In my quest for something new to put on my plate, my tummy has seen the good, the bad and the ugly of Bangalore's offerings. Here is a peek at my gastronomic journey. Of course there is a lot more than just reviews.